Is This Obama's Next Target After Libya? 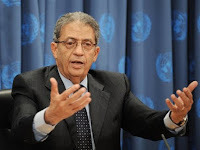 Arab League Secretary General Amr Moussa served on the committee that invented the military doctrine used by President Obama as the main justification for U.S. and international airstrikes against Libya, WND has learned. The discovery is particularly pertinent because on Sunday Moussa announced during a special meeting in Cairo that the Arab League plans to press the U.N. to impose a no-fly zone over the Hamas-controlled Gaza Strip similar to the one imposed now on Libya. Moussa said he plans to present the proposal to the U.N. Security Council. The call comes as Hamas has fired over 140 rockets into Jewish civilian population zones, prompting Israel to carry out anti-terror operations in Gaza aimed at diminishing Hamas’ rocketing capabilities. The doctrine and its founders, as WND reported, have been deeply tied to Obama aide Samantha Power, who reportedly heavily influenced Obama in consultations leading to the decision to bomb Libya. Power is the National Security Council special adviser to Obama on human rights. Now it has emerged that Moussa served on the advisory board of the 2001 commission that originally founded Responsibility to Protect. That commission is called the International Commission on Intervention and State Sovereignty. It invented the term "Responsibility to Protect," while defining its guidelines. On the 2001 commission board with Moussa, as WND first revealed, was Palestinian legislator Hanan Ashrawi, a staunch denier of the Holocaust who long served as the deputy of late PLO leader Yasser Arafat. Also on the commission board was the Carr Center for Human Rights Policy, which was founded by White House aid Samantha Power. Power was Carr's founding executive director and headed the institute at the time it advised in the founding of Responsibility to Protect. She is the National Security Council special adviser to Obama on human rights. She reportedly heavily influenced Obama in consultations leading to the decision to bomb Libya. With Power, Moussa and Ashrawi on its advisory board, the International Commission on Intervention and State Sovereignty first defined the Responsibility to Protect doctrine. In his address to the nation two weeks ago, Obama cited the military doctrine as the main justification for U.S. and international airstrikes against Libya. Indeed, the Libya bombings have been widely regarded as a test of Responsibility to Protect. Responsibility to Protect, or Responsibility to Act as cited by Obama, is a set of principles, now backed by the United Nations, based on the idea that sovereignty is not a privilege but a responsibility that can be revoked if a country is accused of "war crimes," "genocide," "crimes against humanity" or "ethnic cleansing." The term "war crimes" has at times been indiscriminately used by various U.N.-backed international bodies, including the International Criminal Court, or ICC, which applied it to Israeli anti-terror operations in the Gaza Strip. There has been fear the ICC could be used to prosecute U.S. troops. The Global Centre for Responsibility to Protect is the world's leading champion of the military doctrine. Two of global group's advisory board members, Ramesh Thakur and Gareth Evans, are the original founders of the "responsibility" doctrine, with the duo even coining the term "responsibility to protect." As WND reported Soros' Open Society Institute is a primary funder and key proponent of the Global Centre for Responsibility to Protect. Also, Thakur and Evans sit on multiple boards with Soros. Soros' Open Society is one of only three nongovernmental funders of the Global Centre for the Responsibility to Protect. Government sponsors include Australia, Belgium, Canada, the Netherlands, Norway, Rwanda and the U.K.
Annan once famously stated, "State sovereignty, in its most basic sense, is being redefined – not least by the forces of globalization and international co-operation. States are ... instruments at the service of their peoples and not vice versa." Aside from his direct citation of the "responsibility" doctrine in his address explaining why the U.S. is acting against Libya, Obama alluded to the doctrine four more times in his speech. To brush aside America's responsibility as a leader and – more profoundly – our responsibilities to our fellow human beings under such circumstances would have been a betrayal of who we are. The task that I assigned our forces – to protect the Libyan people from immediate danger, and to establish a No Fly Zone – carries with it a U.N. mandate and international support. So would the costs, and our share of the responsibility for what comes next. "Responsibility" founders Evans and Thakur served as co-chair, with Gregorian on the advisory board of the International Commission on Intervention and State Sovereignty, which invented the term "responsibility to protect." In his capacity as co-chair, Evans also played a pivotal role in initiating the fundamental shift from sovereignty as a right to "sovereignty as responsibility." Soros is on the executive board of the International Crisis Group, a "crisis management organization" for which Evans serves as president-emeritus. WND also reported the crisis group has also petitioned for the Algerian government to cease "excessive" military activities against al-Qaida-linked groups and to allow organizations seeking to create an Islamic state to participate in the Algerian government. Soros' own Open Society Institute has funded opposition groups across the Middle East and North Africa, including organizations involved in the current chaos. WND reported yesterday that doctrine founder Thakur recently advocated for a "global rebalancing" and "international redistribution" to create a "New World Order." In a piece last March in the Ottawa Citizen newspaper, "Toward a new world order," Thakur wrote, "Westerners must change lifestyles and support international redistribution." He was referring there to a United Nations-brokered international climate treaty in which he argued, "Developing countries must reorient growth in cleaner and greener directions." "The West's bullying approach to developing nations won't work anymore – global power is shifting to Asia," he wrote. "A much-needed global moral rebalancing is in train," he added. Thakur continued: "Westerners have lost their previous capacity to set standards and rules of behavior for the world. Unless they recognize this reality, there is little prospect of making significant progress in deadlocked international negotiations." Thakur contended "the demonstration of the limits to U.S. and NATO power in Iraq and Afghanistan has left many less fearful of 'superior' western power."